If you are an independent contractor or self-employed you should receive a 1099-MISC from every client who pays you $600 or more during the year. You’ll receive the forms by the end of January. Even if you earned less than $600, you still should report any gross income earned on your income tax return. The income included in Box 7 (non-employee compensation) of your 1099-MISC is reported on your Schedule C Profit or Loss from Business if you are a sole proprietor. The income must also be included on the Schedule SE Self Employment Tax, and you will pay the self-employment tax on your net earnings from self-employment of $400 or more. If there is a dollar amount in Box 1 (rents) or Box 3 (other income), the income will not be subject to the self-employment tax. The amounts in Box 1 should be reported on Schedule E with your rental income and expenses. The amounts in Box 3 should be reported on Line 21 Other Income of your 1040. Your business may receive a 1099-MISC as well. The income reported on the form should agree to your bank deposits and accounting records. This income should be included on your business tax return. The IRS also receives a copy of the 1099-MISC that your client sends to you. The IRS matches their records with the information reported on your tax return. If you fail to report income from a 1099-MISC, the IRS will send you an underpayment of tax notice, including penalties and interest. In most cases, federal income tax is not withheld from 1099-MISC income. In order to decrease your tax liability from the 1099-MISC, make sure you are accounting for all of your business expenses! Some of those expenses include: business mileage, meals and entertainment, office supplies, and travel expenses. Did you receive a 1099-MISC this year? Do you have questions on how to report the income on your tax return? Contact us today! In other news, this will be our last post for a few months. 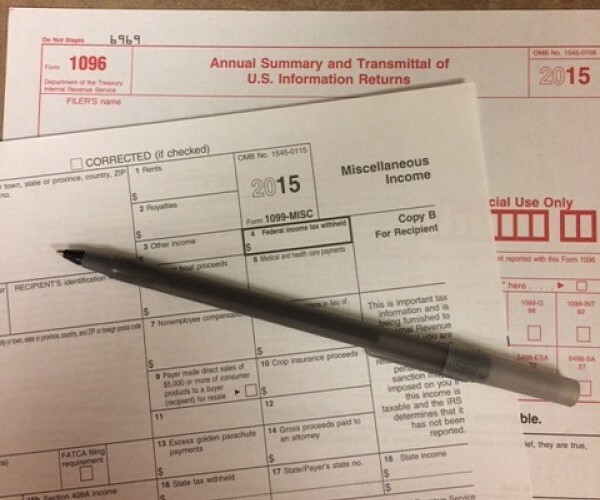 Tax Season is in full swing, but we will be back in May!